Ever since I found out about this Jam, I've had the idea of catching fish with a giant mechanical claw for some reason. Thus, that's what my game will be about. Fire a rocket-powered, remote controlled claw out to sea, and grab fish to sell! Buy upgrades like more fuel to go farther out, or a bigger claw to catch bigger fish! The ultimate goal is to catch Big Red, a huge legendary whale with rubies growing out of its' back. I'm aiming to get the game running on Windows and Linux, but we'll see what happens. Just untar, and run Run.sh(read it if you like, it's just to ensure the working dir is right). Currently, you'll need the listed libraries installed(because I'm lazy), but you can probably figure that out easily enough. Unfortunately, I'm not gonna finish porting this to windows. Sorry! I wrote the entire engine, barring the music streaming code, which I shamelessly stole from a tutorial. The link is in the source. I drew all of the graphics, and my friend Peter Orzell composed the game's music. Move your claw with the mouse. Run into creatures to collect them. After getting the shrink ray, click and hold to fire it. The shrink ray is for submerged creatures(like sharks and whales). Just hold it over them, then collect them like any other creature. Press Escape at any time to quit. With the money you earn from catches, you can make upgrades after each run. Try and catch Big Red! Soooooo..... Yay for open source, I guess? Last edited by Df458 on Sat Jun 01, 2013 12:30 pm, edited 22 times in total. Well, it's the 20th. Time to start this! I've got a black window, a whole lot of backend work, and a realization that I'm sorely out of practice. I also drew the first claw(I'm thinking of making it look different when you upgrade its' size). I'm taking a short break, then I'll get sprites displaying. EDIT: It's lunch time, and sprites work. I've got position, rotation, and custom origins working fine, but scaling needs to happen BEFORE rotation, as it happens after it right now. Right, I've finally got a basic entity system up and running. Two 'main' backend bits left: input and sound. input should be a snap, but I can't say whether sound will be easy or not, as I'm using OpenAL directly for the first time. Also, during a little afternoon slump, I drew a simple mockup. It's up in the development album. This is a neat idea. Are you using OpenGL for graphics? I actually just put down a full list of the libraries I'm using in the first post. First update of Day 2! I've successfully gotten keyboard and mouse input working, and my claw can now follow the mouse around onscreen. Next up, I'm going to write the sprite animation code! I made some passable water, and got animations working. I've been pretty lazy today, though. Next is collision detection, which should be interesting since I've never written a decent collision detection system before. 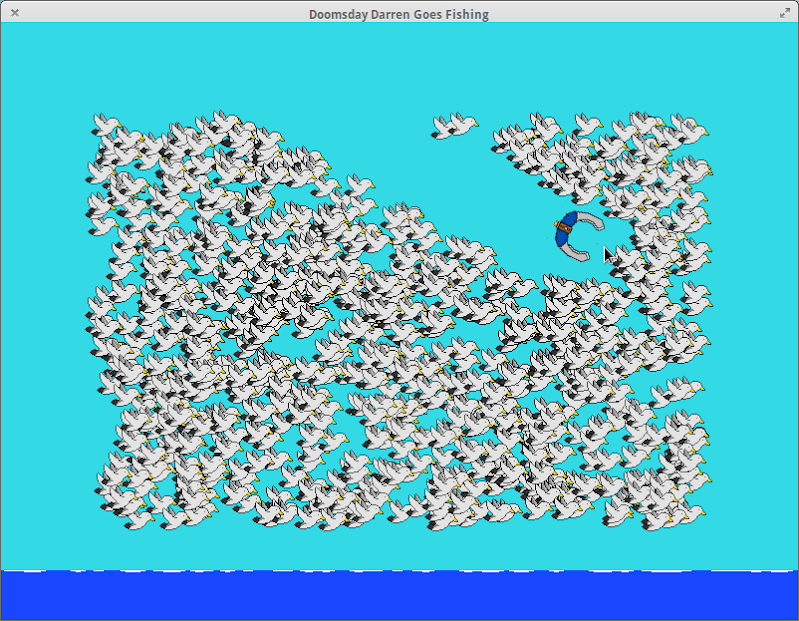 Day 3 update 1: I FINALLY did collision detection, along with fast deletion of objects. Man, this is finally feeling more doable!